As I sat in the auditorium watching someone present a really uninteresting piece of software, I could not help but check my twitter timeline. It was on March 19th right before the ArabNet Beirut event. 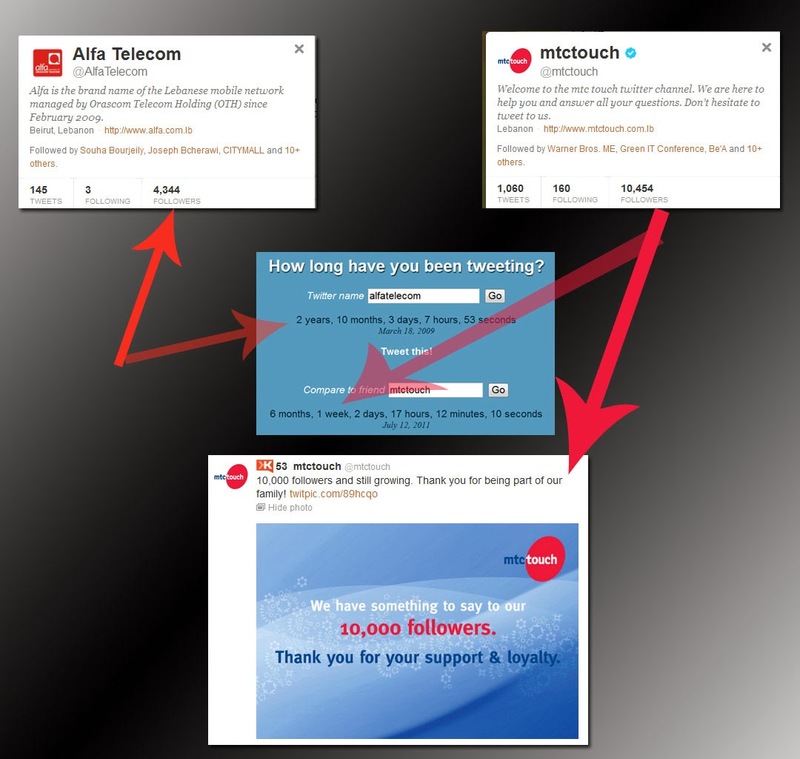 Alfa Telecommunications, one of Lebanon's two (duopole) mobile operators had been trying to boost their twitter following after their direct competitor Touch had overtaken them. I cannot speculate whether this heightened interest in getting more followers had been instigated by me reaching out to some very high "powers that be" within Alfa pointing out how badly their social media is being run. I had been part of the original staff that worked at Cellis which later became Alfa and I felt bad to see them trailing behind Touch after I had personally and single handedly launched them into social way ahead of their competition. Without digressing further, Alfa was giving away valuable tickets to attend ArabNet to its follower base. A normal and fair practice that normally gets you to do something engaging in return for a prize. What was not normal for me was to see the community manager behind the twitter account attributing the ticket to one of alfa's own employees. I easily recognized the name based on my long period working there but I was not about to let my past relationship with Alfa cloud my sense of Right and Wrong. Someone was taking the public for a ride. Whether it was intentional and malicious or simply oblivious it did not matter any more. The person on the left was confirmed as an employee. Alfa eventually took corrective measures in a format that suggested they were as surprised as everybody else by the fact that the winner was their own employee (even though his twitter bio pointed to linkedin where his job at alfa was prominently stated). In retrospect, being caught with their hand in the jar could have been the best thing to have happened to Alfa as all other maneuvers were falling flat on their face. This made many people realize that the number 2 operator was on twitter and perhaps made Alfa realize that social media was serious business. Billboards, TV commercials, brochures and the occasional sponsoring tactics were no longer enough to make themselves noticed. And this time the people could shout back their opinions. Welcome to the era of Social Media Marketing!